Jade | Real in L.A.
Back east, where I lived for most of my life, jade plants were delicate things in small pots. Even the one I gave to my mother, gardener par excellence, remained bonsai-size, never taller than 7 or 8 inches. At a North Shore Chicago florist, where I worked in graduate school, we marveled at a splendiferous jade plant brought in for repotting. It must have been a couple feet across–a veritable tree! Then I moved to Southern California and discovered that jade plants grow like weeds here. 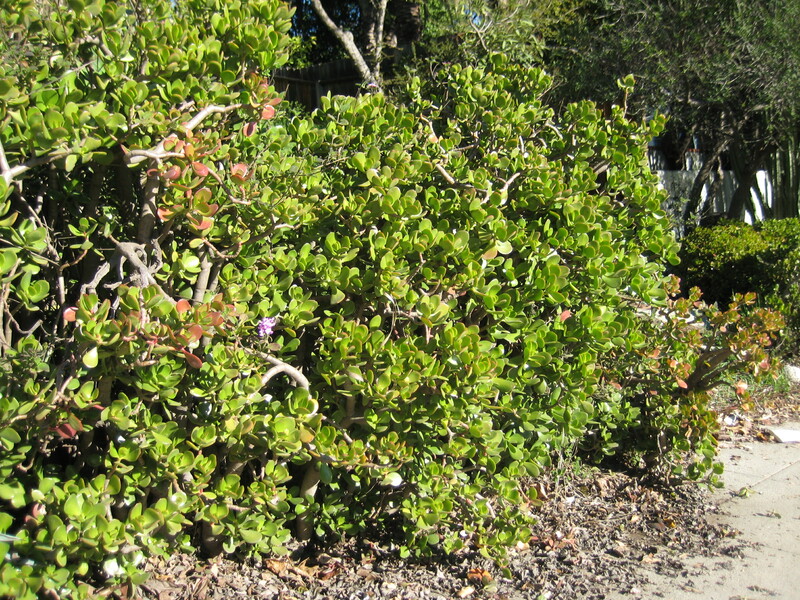 One of my neighbors has a 20-foot-wide thicket of jade plants along the perimeter of her property. Every year in the dry season, the plant’s thumb-like leaves shrivel into desiccated remnants of their former selves, and I think, “Surely this time they’re dead.” And every year when the rains come, the leaves plump up again in a remarkable display of regeneration. In a region where seasonal changes are subtle, I admire the jade’s blatant surprise. You are currently reading Jade at Real in L.A..